You'll love this super-cute house with a big front yard. 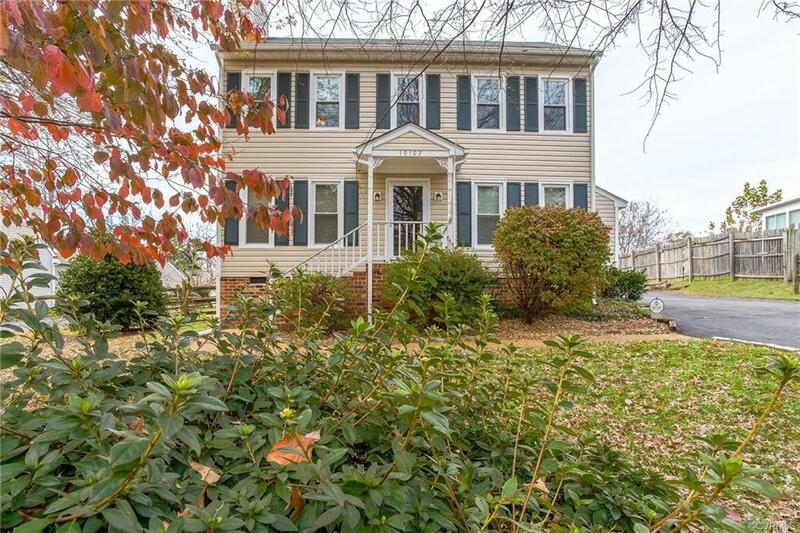 Don't miss out on this perfect starter home in the Thomas Dale school district! This home has newer vinyl siding and windows. The spacious living room features a gas log fireplace and tons of natural light. The eat-in kitchen is equipped with a water filtration system, all SS appliances and beautiful wood cabinetry. Downstairs also hosts a formal dining room that could be used as an office. Upstairs, we have a large master BR with a walk-in closet and full bath; two additional bedrooms and second full bath. All hardwood and vinyl flooring throughout! The exterior features a spacious 24x24 detached 2 car garage with pedestrian door, (and the shed wired for electricity makes for a perfect workshop! ), plus the rear deck with firepit conveys! Everything on your checklist is here! All nestled in the quiet, well kept Hilltop Farms neighborhood. Easy commute to 288, 95, Fort Lee and Richmond! Directions: From 288, Take Chester Rd Exit, Turn Left Onto Centralia Rd, Left On To Hilltop Farms Dr. (First Left On Centralia), Right On Farm Field Dr, Right On Farm Field Ct. Home Is On Your Right.